The memorial hall in the Slavutych, Ukraine, city museum is dedicated to workers who died immediately following the Chernobyl explosion. Sergii Kasyanchuk manages the museum now that his health no longer allows him to enter the Exclusion Zone. 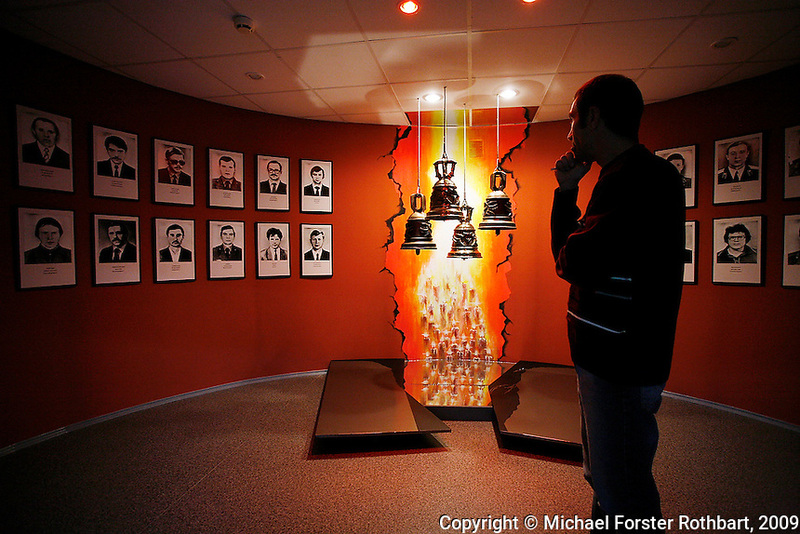 Original caption: .Photo title:.Memorial in the Slavutych museum..Caption:..In Slavutych, a memorial hall in the city museum is dedicated to the Chernobyl accident, with photographs of the men and women who died immediately following the explosion. ..Former Chernobyl plant worker Sergii Kasyanchuk manages the Chernobyl Information Center museum now that his health no longer allows him to enter the Chernobyl Exclusion Zone. More than half the families in Slavutych have a member who still works at the plant, and everyone knows colleagues who became ill or died due to Chernobyl...If you lived here, would you stay? .-------------------.